Hello again. Wow what a week. Its been amazing, confusing, stressful, tiring, scary, fun and inspirational! Since my last today update (can be viewed here). Seth there have been a number of days where Seth has had a temperature which has resulted in increased respiratory rate, heart rate and blood pressure, but he has remained happy and positive in himself. As a result of this we have had a CT scan this week under general anaesthetic. The results of this show two areas of infection in the top of both lungs. Obviously this is a concern and it means that he needs the transplant soon if he remains without any form of protection as it seem the antibiotics he is on is managing it to an extent but they may not cope long term. They did manage to get a good sample of mucous from his chest whilst he was asleep so hopefully something grows from that and we are able to identify what exactly it is on his chest….fingers crossed! “They will give a drug called ATG everYday for 5 days starting Monday 9th March. This drug wipes out all the T cells. Then we wait. There is a possibility that Seth’s own neutrophils will come back, but they may not. He may be left with an empty bone marrow if the T cells have been able to cause enough damage. So them coming back and giving him a little bit of protection is best case. So, here i was talking about them giving Seth a drug called ATG. This drug kills active T cells. The aim was to get rid of the cells from the last transplant to allow his bone marrow to have a break and his body to return to normal function. The intention was that he would start to maintain red blood cells and platelets again and there was a small hope that his own neutrophils would return to provide some protection over the next few weeks while we wait for transplant. So, over the past few days Seth’s bloods have shown a very small insignificant increase in his neutrophils (not enough to provide him with any sort of cover), BUT also an increase in his Lymphocytes (T and B cells) which means that the T cells they got rid of are now coming back……… this is where it gets complicated…. This could mean that his bone marrow is now producing T cells (donor ones as he will never be able to produce ones from his own DNA). These could be well-behaved T cells and provide him with protection and a working immune system (however, we are not seeing any significant increase in other immune cells at the moment). OR his bone marrow could be producing T cells that are not well-behaved (like the ones that were killed off by the ATG). These would come back and cause Graft Versus Host Disease again. Seth has damage to his skin from Graft Versus Host Disease and he has damage and infection in his chest. So these T cells may cause problems there, which we do not want. So at the minute we don’t know whats going on!!!! They are taking blood to look into what cells are there in more detail to be able see more of what is going on, and this week he has his gallbladder removed and a few other bits done in surgery. Whilst he is recovering from this we will be monitoring what is going on with his immune system and skin and discussing the plan with the doctors. This week Seth has moved rooms to his transplant room. He is in stricter red isolation so we are washing our hands more than ever which is making them red and sore, but that’s nothing in comparison with what Seth has been through so we’ll get on with it! Also we have had the amazing #wearyellowforseth day. Which Seth loved. He was visited by local firemen who gave him a real fire suit and brought the fire engine outside his room. They then got lifted up to his window. (https://youtu.be/n9OSXjLLwHM). He loved every second. He has also receive gifts from various people, which has kept him busy. But he has especially loved looking at everyone’s pictures! The dogs dressed in yellow has made him laugh out loud, he has been asking to look at more and had an amazing day Friday spending most of the day out of his bed and on his feet. If you want to see ALL the pictures posted to ALL social media you can at http://www.wearyellowforseth.com. Saturday morning he wanted it to be yellow day again – because that was his favourite day! So thank you everyone! We really had an amazing day and the positivity shared on that day will help us keep Seth positive for a long time. YOU ALL DID GOOD!!! 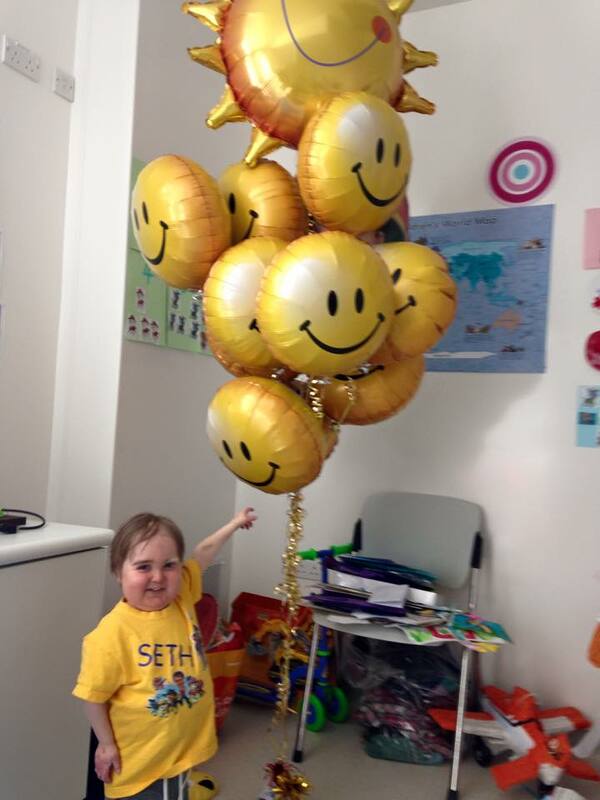 Seth received some balloons from someone and LOVED them! Seth and Me sporting our matching t shirts! hello, I hope Seth is okay and getting better.. I wish him the best of luck.. I didn’t know about this till it come across on facebook..
What a strong handsome little fella! Brings tears to my eyes on how well Seth copes! Such a joy to know he still manages to smile! I would love to help in any way possible i would be happy to donate bone marrow if I would be a match! My son was diagnosed with SCIDS but was unfortunately to late he passed away a week later at 16 weeks old. Seth is such an inspiration even though I don’t know him I am so proud! Well done Seth keep fighting ! I pray for you and your family everyday! We’re praying for you Seth. Thinking of your family. I will check all the time to see how you’re doing. I was wondering if Seth would benefit from being given a auto immune disease. Like Lupus or something that would give him a positive ANA on a blood test. This may sound weird but they are treating cancer with Polio…just a thought. I pray for him and hope the best for for him. he is super cute. Hi Jen. I understand where you are coming from with this but Seth has no ability to create cells so giving him a disease would just cause the disease to make him unwell. But thank you for thinking of him and considering solutions! You are such a brave little boy Seth. 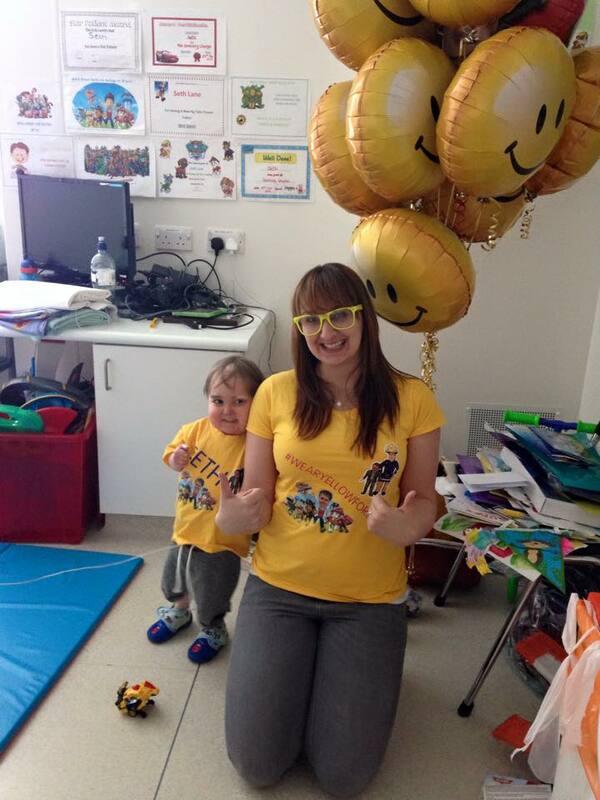 So glad that you loved the #wearyellowforseth day, you look so happy! Stay strong, best wishes from Norway. The connections we make will never cease to amaze and inspire me! I see hundreds of links on Facebook…and occasionally some will resonate with me for one reason or another. Upon finding a link to your Blog and reading your posts and the stories behind your beautiful son Seth…I am now beginning to think that the link found me! I live thousands of kilometres away from you…and yet your story has attached itself to my heart as if you were a member of my small community! Your strength as a person and a mother is completely admirable, and there is just something about the spirit in Seth’s eyes when he smiles that compels me to send prayers to him everyday (since reading his story)! I am so sorry that I didn’t send a picture for WearYellowForSeth day…but enjoyed ready how happy he was to receive all the support he did! I will continue to send thoughts and prayers to you and Seth…I wish I could do more! I loved dressing up in yellow for you, although I was a bit camera shy. I’m going to get my human mummy to look for another yellow hat- more photos to come! Seth, we all feeling so blessed coz we can see your smile! Don’t give up! U can make it coz u have got this yellow power from all of us who lives different places in the world. We all behind u Seth! I love u! SETH the HERO! Ur smiles make my day in the truest sense. Thank you very much Leanne for posting his pictures. I quote again “A small smile on Seth’s face, is a Giant Laughter on the faces of entire mankind”. Leanne you have done great service to all of us. The day when I come and salute, shake hands and then cuddle my Hero SETH is not very far. Thank you very very much SETH, thank you Leanne. GO YELLOW ! Hi, I’m an editor of SINA.com, which is a Chinese media corporation. We have collected hundreds of pictures of our readers wearing yellow for SETH. We really hope to contact you and send you those pictures. Greetings and Best wishes from CHINA!!!!! Seth ,my HEART, i hope these are well-behaved T cells… i wish i could take your pain away. you cant even fathom the impact Seth has on my life now. thank you for keeping us posted on his progress. You Go my HERO, THINKING AND ROOTING FOR YOU ALWAYS AND FOREVER . love youuuuu soooooo much ,so so much!!! We also sent a gift, so Seth will remember his friends from Romania. Because we did not have the home address, we redirected it to the hospital address. We think it will arrive at the secretary/reception area at the hospital. It should be there by tomorrow (Tuesday, the 31st) the latest. We also wrote on the package ‘to be delivered to Seth’s room’. Thank you that is very kind. We will keep an eye out for it!! Maybe let us know that the package has arrived. We would be very glad to hear so. Hello. Raluca. Please can you let me know what you sent so we can make sure we have received it? The package contained decorated apparel and a letter addressed to Seth. We hope it arrived safely and everything intact. I am sorry I don’t think that one has arrived yet. I will keep an eye out for it though. Thank you. I hope and pray it is the well behaved T cells and all Seth’s defence systems start picking up soon. I’m glad you all enjoyed the pictures sent from around the world Seth is now almost as famous as Fireman Sam! Keep fighting Seth you are our little super hero! You might want to go back to social media, because there are new pictures today. I for one confused the days and posted mine today, and I know 11 more people wanted to show their support for him today. Maybe that will make him love every day of the week. While I’m here, I was wondering, do you have a number on the US that we can text to donate? I don’t have a lot of money and I still think it would be cool to repost a number for him to get fund from the US. Let me know. Hi. We’re still going through social media. Don’t worry we don’t want to miss anything! I am writing you from Belgium where we follow the story of Seth with great attention and love since you post the video. He is such a special kid who, like Cupidon, send an arrow in the middle of everyone’s heart. Humanity needs beautifull soul like his. We are very lucky. We hope everything went well with the surgery today. Could you please tell him that the support he saw on internet was not only for the 27th but for everyday ? Whising you all the best! Nb: We have found three different wearyellowforseth’s Facebook pages. Is it you, the all three? Hello. Thanks for your message. We are the facebook page – wearyellowforseth. Hey Seth ! I want you to know that my biggest wish is for you get better. I think about you and my nephew Andy every single day 😊 . I want you guys to meet and become good friends because you two are very alike! You both are superheroes. I believe in miracles and i know that like my Andy you are a miracle too! Keep strong my lovely hero. I know you can do it !!!! Love to mom and Dad and obviously the handsome Hugo ! P.S.– So jealous of your guys shirts in the picture! They are extremely cool! Hi Kayla. I don’t think he has received your card yet. Seth, you have touched my heart sometimes I lt feels like you have to walk around acting like your heartless but really seeing you brought back the good in people. Seeing how you have touched so many people all over the world. Even if it’s for oneday it’s was a huge day! You put all the trash that gossip off tv. I wish it was always a day like seth!!! Stay strong and stay true always!!! I’m hopeful that Seth recovers well from his Gall Bladder surgery in preparation for his bone marrow transplant. I read about his surgery on the ABC News web site and I want you to know so many people are pulling for Seth. Thanks Michael he’s already a bit better today. Still a bit sore but he’s been sat up playing. Hopefully out of his bed tomorrow! Hey Seth ! Its been weeks that i dont know anything about you 😞 i hope everything is going great ! 😽😽💛💛💛💛 love you little super hero ! This little stud is so strong! My company, Jawbone, participated in #wearyellowforseth, and we had something we were hoping to send to you guys. Is there an address I could get? !